From scratch Grapefruit Upside Down Cake is made with fresh, sweet Florida Grapefruit and a cake batter that results in a soft, fluffy cake. Garnished with fresh chopped basil for complimentary flavor. Today I want to talk about delicious Florida grapefruit. Sure, it may not be as pretty as the grapefruit grown in other areas but Florida grapefruit is the sweetest most delicious grapefruit you’ll ever taste! I live in Florida and can get my hands on Florida grapefruit year-round. But did you know that you can often find Florida grapefruit in markets in other states between the months of November and May? Just checked – it’s only February so you need to get to the market and pick up some delicious Florida grapefruit! We are traveling to Asheville, NC in April and you can bet your last dollar that I’ll be checking to see if I can get my hands on some Florida grapefruit while on vacation! Before looking outside of the box, I only considered grapefruit as a fruit to enjoy in a smoothie, as juice, in a salad or simply sprinkled with a little sugar. But today I am going to show you that you can also enjoy fresh grapefruit in baked goods, like this Grapefruit Upside Down Cake. Ken is a fan of grapefruit. A whole grapefruit provides him with over 100% of the daily recommended value of vitamin C. He loves grapefruit juice and he loves plane ole grapefruit, too. He also likes cake. Who doesn’t? Initially I was going to make a healthy grapefruit recipe but for the love of Ken, and to live on the edge a little, I settled on a grapefruit upside down cake. Ken was happy about this. What’s not to be happy about? The cake was soft and fluffy. The topping was sweet and tart from the grapefruit and the brown sugar. Basil is one of the herbs that grapefruit pairs well with so I added some chopped fresh basil to the cake batter and to the top of the cake for garnish. I added a pinch of allspice to the batter as well. It was totally random and I really don’t think it affected the flavor at all. So use it or leave it out, whichever you prefer. Serve the cake with vanilla bean ice cream or fresh homemade whipped cream. Or enjoy it alone like we did! ¼ tsp fresh chopped basil plus more for garnish. Grease a 9 inch baking pan with cooking spray. Wipe away excess with a paper towel. Cut the grapefruit in half lengthwise. Carefully remove the grapefruit from the peel by cutting around the inside and between each piece of the grapefruit. Then pop the grapefruit out of the peel with a fork. Set aside. In a saucepan, melt the 4 tbsp butter over medium heat. Add the brown sugar and stir until bubbly. Pour the mixture into the prepared cake pan. Place the grapefruit pieces on top of the mixture and then set aside. Prepare the cake by whisking together the flour, baking powder, salt, allspice and basil. In another bowl, whisk together the eggs and vanilla extract. In the bowl of a stand mixer, beat the ¾ C butter on medium speed until fluffy. Gradually add the granulated sugar and beat for 2-3 minutes. Add the egg mixture and beat until combined. Add the flour mixture in 2 batches, alternating with the milk. Beat until smooth. Pour the mixture over the grapefruit pieces in the cake pan. Smooth evenly. Bake for 35-40 minutes. Remove the cake from the oven and cool on a wire rack for 10 minutes. Once cooled, loosen the cake by running a butter knife around the edge of the pan. Flip the cake over on a plate. Garnish with chopped basil, if desired. 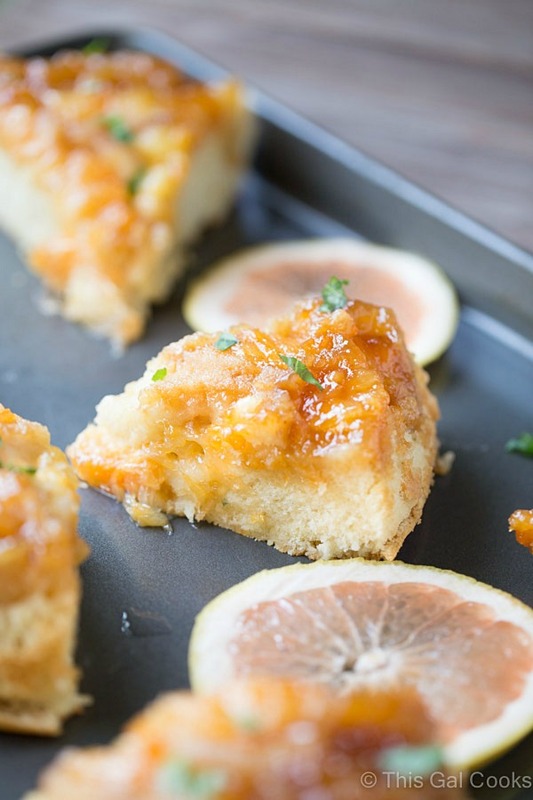 Love this Grapefruit Upside Down Cake? Here are a few more grapefruit recipes that you may love! Baked Grapefruit Donuts | Urban Bakes. Grapefruit Orange Pound Cake | Blahnik Baker. Tropical Grapefruit Parfait | The Seasoned Mom. This cake looks incredible, Julie! I love that you used grapefruit in here, so creative! Definitely makes me want to run out and buy some grapefruit now! I love red grapefruit and would have never thought of making a cake with them, so I’m really glad you posted this recipe! I am saving it for sure! Hope you enjoy the recipe if you give it a try, Emily! Red grapefruit is my favorite type! Wow, this cake looks amazing, Julie! Even though I eat grapefruit every day, I very rarely bake with it. The chopped basil is a great addition! Such a refreshing (literally and figuratively) twist on the pineapple upside cake! I just love the tartness of grapefruit, especially since I don’t go gaga for crazy amounts of sugar. Looks delicious. Thanks Nicole! The tartness of the grapefruit balances out the sweetness from the brown sugar topping perfectly! What a pretty cake and I love the idea of using grapefruit, so clever! Julie this cake looks so good! We also love grapefruit. Hey, Julie! Thanks so much for sharing our parfait recipe! I love that snack so much that I had one yesterday…it has worked its way into our regular meal plan! This cake looks absolutely delicious. Pinned! You’re welcome, Blair! That parfait looks amazing! Thanks for stopping by and for the compliment and pin, too! This is interesting and I bet tasty! Thanks for sharing, I’ve never heard of a grapefruit upside cake before. Nom! Love this perfectly in season Winter fruit dessert – perfection! Glad you like it, Melanie! Yummy – thanks so much. I love red grapefruit. Love this so much, Julie!! Pinned! What a great idea, grapefruit instead of pineapples! Love it. So fresh and springy :) I hope you have a fantastic time in Asheville. I went there on vacation in 2013 and it was so lovely! Have you been there before? Definitely visit French Broad Chocolates’ “The Chocolate Lounge” at 10 South Pack Square. They have a drink called Liquid Truffle. I had it every day for four days in a row!! Best. Drinking. Chocolate. Of. My. Life! 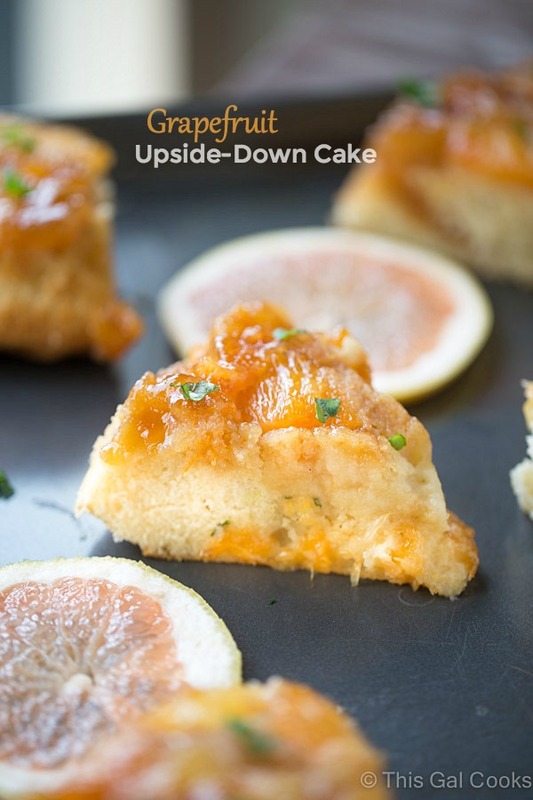 This is such a creative twist on upside down cake! Love this recipe! I’m so jealous that you can get grapefruit year-round! This cake looks amazing! I love how you paired the grapefruit with the basil, what a great combination! Thanks so much, Danae! We can get a lot of fruits year-round! I’m so intrigued by this dessert! It looks delicious! I love this! Grapefruit is my favorite so I know I’d love it in this cake! Using grapefruit for an upside down cake is genius girl! I love Florida grapefruit! In high school we had a choir fundraiser each year and sold Florida grapefruit to earn money for a trip to Disneyworld. I never got tired of eating it. Your cake looks like a great way to enjoy fruits in desserts. Yum! Oh so glad that you like the FL grapefruit too, Holly! Thanks for stopping by and for the compliment, too! Wonderful pecipe, the cake looks so apetite! This cake looks incredible, Julie! 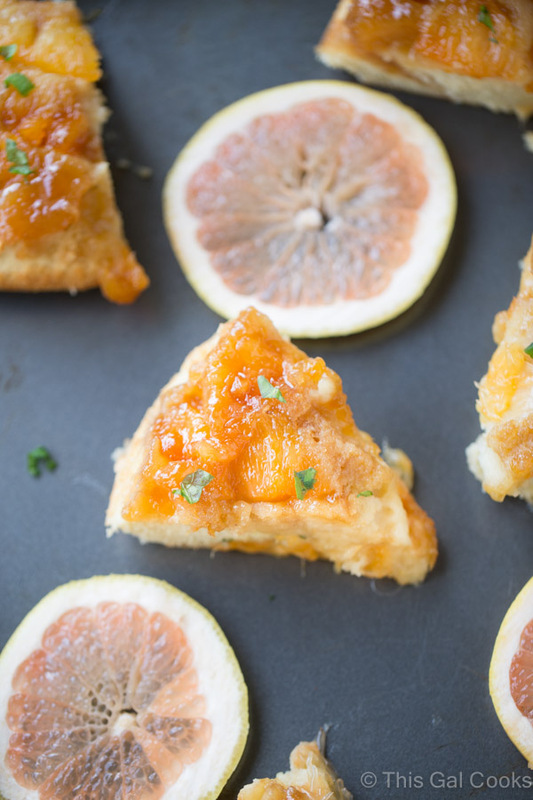 Love grapefruit and making an upside down cake is such a great idea! Sounds delicious and so refreshing! Surprisingly enough – our grapefruits are pretty OK here in Holland. Will have to give this one a try!